good solid watch... really like this one. This beautiful ladies watch from August Steiner features a reliable Japanese quartz movement. 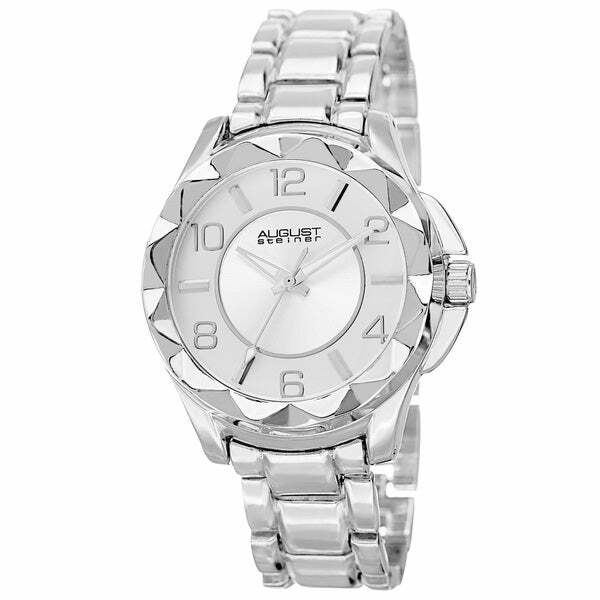 The stunning pyramid patterned bezel adds to the sophistication of this timepiece. This simple yet stylish watch is an excellent addition to every wardrobe. I love the weight, and the design workmanship of this watch. This watch is absolutely gorgeous and I love it. The delivery was quick. I will have to have several links removed because it is so big. I'm glad that it is too big rather than too small. I would highly recommend this product to all of my friends and family or anyone else for that matter. Thanks again Overstock.com. The watch was too big and turned my wrist green!! It wouldn't come off for two days!! I had to scrub my wrist until it came off!! Beautiful and very heavy. she loves it.